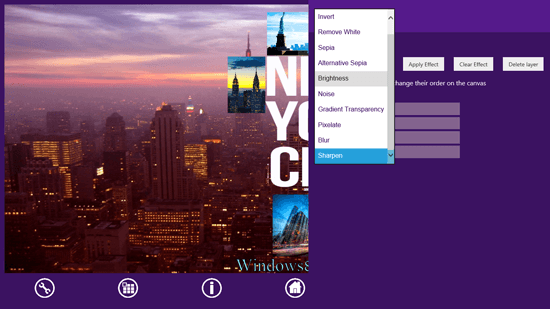 Collager is a free collage maker app available for free in Windows Store for Windows 8 and 8.1. Collager helps you to create great collage with your images or photos for free. It is a collage maker that is free and has nice user-interface. The app has a blank purple canvas when you open it, you can add color or an image for your picture’s background. 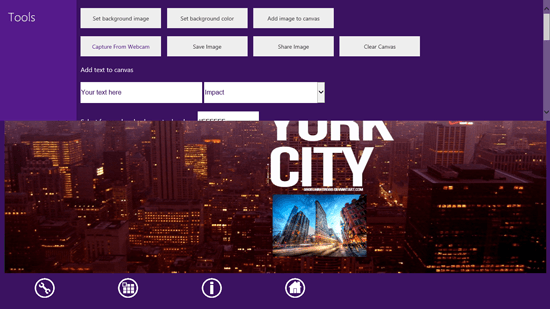 You can add background image from your desktop or SkyDrive. The menus of the collage maker app are on the bottom of it, The menu to add image or text or color on the canvas is shown by wrench icon, the menu for editing the selected layer is beside it in a collage icon, the small i icon is for help and to understand what you can do from where. The last option of the menu is home icon that will take you to the start page of Collager app. The tools included in Collager include set background image, set background color, add image to canvas, capture from webcam, save image, share image and clear canvas. The tools for text include a bar to add your text, the font of text, set font fill color, set font stroke color, add background color, color wheel, tab to enter hex for color and add text. The layer options include photo effects like invert, sepia, noise, blur, gradient transparency, brightness, sharpen, etc; apply effect, clear effect and delete layer buttons and the list of layers on the canvas. You can drag the layers from the list up and down to change the order how they appear on the canvas. Each photo that is added on the canvas can be resized by dragging the corners of it. To move the photo around the canvas and place it where you want it to be, you can select it and move it with your cursor across the canvas.